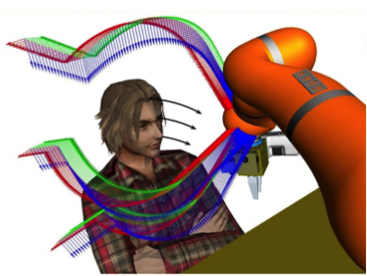 With the recent advances in physical Human-Robot Interaction it becomes increasingly important to plan and execute complex motions for task achievement in the vicinity of humans. A major open problem that is especially important for pHRI is motion generation for dynamic environments that solves the completeness-versatility polarity. This means finding a feasible path if one exists but at the same time planning fast enough to change it in accordance to dynamic changes of the environment. Up to now there exists no motion planning algorithm capable of dealing with the proximity of dynamic obstacles, possibly under the absolute premise of human safety. In WP6, we will try to overcome the traditional approach of separating motion generation from control and design entirely new solutions.